The age of the off-the-shelf look for artificial limbs is slowly coming to an end. With significant advancements in 3D printing technology in recent years a number of companies are now offering stylish prosthetic covers. Emelie from Anatomic Studios in Malmö/Sweden tells us more about the company and their approach to assisting amputees to find their personal style. Emelie, if you were to sum up the essence of Anatomic Studios and what it stands for in one sentence, what would that be? We mix design, fashion and 3D-technology to create tailor-made prosthetic covers that give amputees the possibility to express their individuality and style through the look of their prostheses. What do you think sets your company apart from other companies producing covers for artificial limbs? As a company and design studio our core is creating design and fashion with attention to personal aesthetics. Covers offered by pure prosthetic companies are generally standardised products often made from a soft foam material covered in a nylon stocking, attempting to resemble the remaining limb. There’s not much space for personalisation beyond “what shade of beige/brown would you like for the nylon stocking?”. We want to go in the complete opposite direction – create something highly personal, where a cover can be so much more and where the user also can be a part of the creative process of making the design. We see our covers as a personal lifestyle product and something you can wear and change depending on where you’re going and what you’re doing. We also try to present our covers in a way that we hope can give our clients inspiration and ideas on how to mix and match the covers with different outfits. So we work from a design and fashion angle - our covers are tailor-made accessories and not standardised medical devices. Can you tell us a bit more about your personal background/the background of the people involved in setting up Anatomic Studios? When did it all start and how? What was their motivation to get engaged in this niche? We are three co-founders behind Anatomic Studios – myself and Staffan, who are both designers and Christian who has a background as a prosthetist. Me, I have always loved sewing, creating things and experimenting with fashion (my mum was actually a bit surprised when I told her I was going to study engineering and design instead of going to fashion school). Staffan is an industrial designer since over 10 years back and worked in a bunch of different industries and in the last few years designing smart wearables and watches. 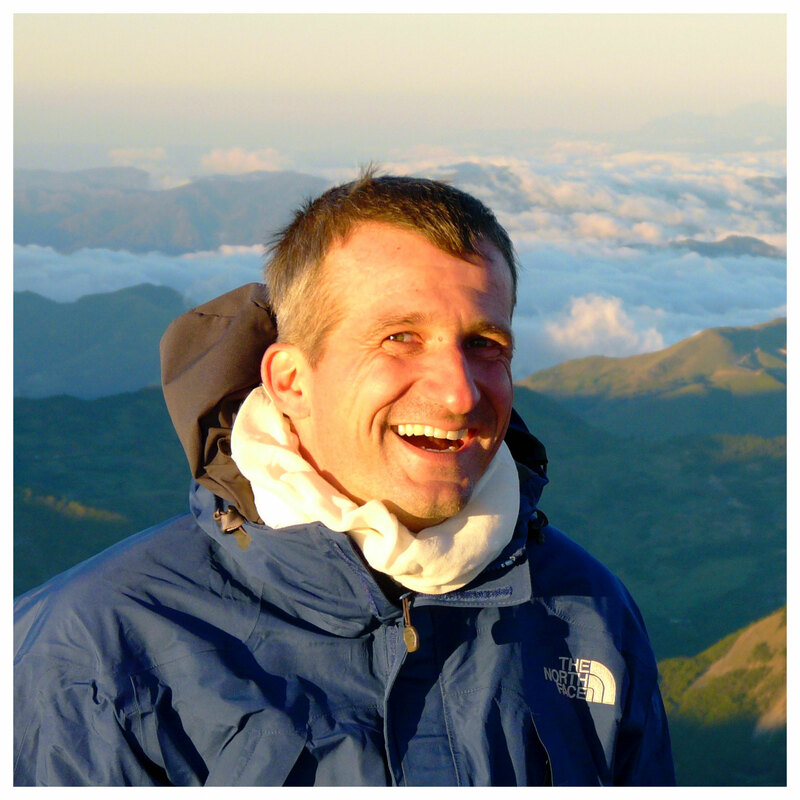 Christian has been working closely with both upper- and lower-limb amputees for the past 11 years. Our story actually started when Christian, in his work as a prosthetist, had a client named Julia whom he had been working with since she was a child. In her teens, she was starting to feel really unhappy about how her prosthesis looked and the fact that she didn’t have a lot of options to choose from – she had tried the standard foam and stocking covers but didn’t like it at all and she didn’t feel comfortable wearing the prosthesis bare either. Eventually it got to the point where she refused to wear her prosthesis entirely. Of course, Christian wanted to do everything he could to get Julia to start wearing her prosthesis again, so he got in touch with his childhood friend Staffan, who then helped design an initial concept for Julia. Meanwhile, I was doing my Master’s project as the final part of my technical design studies, where I was developing a method using 3D-technology to design and create customized prosthetic arms and sockets. Through that, I got to know Christian, who later introduced me and Staffan to each other. We all met over a cup of coffee and talked about how we couldn’t just let this remain a concept and a one time thing, especially after seeing how much it had meant to Julia. So, after a few more cups of coffee, we just decided – let’s go for it! And here we are now, just over 2 years later - three friends working together as Anatomic Studios. We all have so much love for working creatively and in a very people-oriented way, and to have this mix of backgrounds from both design, fashion and prosthetics is something that we really value when building our product and our studio - design and fashion is our core, but to us it’s also so important that function and fashion can work together when it comes to this type of product, that what we create won’t limit or compromise the function of the prosthesis itself, so to have that in-depth knowledge and experience in the team as well, is really worth a lot to us and we learn so much from each other and our respective areas of expertise every single day. Following up on this, can go walk us through the history of the company, the main stages of Anatomic Studios‘ development and how it became what it is today? What were the landmarks along the way/times when you knew you have just come around an important corner and are moving on to the next level, so to speak? An important landmark early on for us was getting accepted to MINC - an incubator for startups and a community of entrepreneurs. This allowed us to start building a foundation, a place to have our studio and where we also can meet and connect with other entrepreneurs. It’s truly an inspiring environment where everyone’s working on such vastly different things but still sharing a mutual dream and aspiration to create something great from their ideas and also supporting each other along the way. It’s actually where we still have our studio, now two years later. We’ve also received two design awards that both have meant a lot to us, but in different ways – one was in the design category at the Swedish Plastovationer Awards, which resulted in press coverage and exposure that helped raise awareness about our work on a wider scale here in Sweden, also outside of the world of prosthetics. The other one was actually from the governmental body that handles reimbursement for health care in the south of Sweden – the fact that the ones responsible for reimbursement of prosthetic products for amputees acknowledges the importance of choice and user influence when it comes to prosthetic appearance, was of course a big deal for us. Another important milestone for us was this past fall, when we were recognized by the Swedish innovation agency who helps support innovation projects in different fields. Out of hundreds of applicants we were one of the few selected in the field of fashiontech, and this was in the company of big fashion brands like H&M and established accessory and watch brands. We almost couldn’t believe it when we got the news and it is really giving us the chance to now start exploring more of the possibilities with the platform and service we want to create for our clients. Before starting with Anatomic Studios, did you have any contact with amputees or people with limb differences? In the initial phase of setting up Anatomic Studios, were any amputees involved in developing the initial concept for the products? How about now that you are established and are better known? Since Christian has a background as a prosthetist, he’s been working with both upper- and lower-limb amputees for many years and noticed how several of his clients were starting to express a need for more cosmetic options, something I also noticed from the prosthetic users I met while doing my master’s project. For the first concept of our covers, Julia became a big part of the development process, both in terms of the style of her design and the usability of the cover. After that, we continued having a dialogue with the early adopters that were willing to give our covers a try. Their input together with some trial and error has made the product what it is now. But I think this is an ongoing journey - to keep evolving and improving our product and ourselves as a design studio, the most important thing will always be listening to feedback from the people using our products, and that will be as important 5 or 10 years from now as it was when we first started out. When you look back, what was the initial reaction of people around you when they heard about your idea? What were the main challenges - from a business perspective, on terms of acceptance with amputees, from a technical perspective, from any other point of view - when you first started out? When starting out, the reactions we received were a bit mixed. The initial response from prosthetic wearers was nothing but positive - some had tried standard foam cosmetics before and wanted something else, some had a prosthetic solution that didn’t work using together with the standard cosmetic and they missed having a silhouette that filled out their boots or pant legs. There was (and still is) an excitement about being able to choose your own design and also a curiosity around what is actually possible to make. To us, that really was a confirmation that we were on the right track. The challenge has mostly been acceptance from people working in the prosthetics industry. Some were hesitant, I think mainly because it’s a new type of product created from a new perspective and with methods that are not yet widely used in the industry, like for example 3D-printing. Some also questioned if a product like this was really needed and if it actually added value to users. In those cases, being able to talk about the experiences and stories from our first clients and what the product meant to them, turned many of the people who started out as critics into supporters. But hey, even if you can’t win everyone over at once, we’ve always seen it as something positive to just get a conversation going that can help put more light on how important self-expression is and how prosthetic appearance is a part of that in the same way as the clothes we choose to wear. Another challenge, but more from our personal perspective, is to learn to be patient and let things take it’s time – as a new company there are so many exciting ideas, so many things we want to do and accomplish, but somewhere you’ve also just got to trust the process and keep working hard to get piece by piece in place. It’s amazing how much that has happened in just over two years and there have been quite a few moments that we are both proud and thankful for - the two design awards I mentioned before are definitely part of them. Also, as a new design studio and from small resources, starting to build something that in the very beginning was still only a seed, and to now see more and more of our initial ideas and vision with the studio come to life bit by bit, that is really a cool experience. Another cool and pretty unexpected experience was being asked to present our work to His Majesty the King of Sweden last year. It’s always a big fuss around him in the press wherever he goes; waking up the next morning we see big pictures of the King curiously checking out one of our covers in many of the country’s biggest newspapers, which of course helped spread the word about our work on a larger scale here in Sweden. The moments that mean the most to us, though, are every time we hear from a client telling us how their cover has changed the way they view their prosthesis, how they now roll up the leg of their pants to show it off and how it’s now like a piece of jewelry they can match with their outfit - that is exactly what we’ve always wanted to achieve with our work since the very beginning, so to hear that is really the best confirmation we can get that we are doing something right. We've also had the opportunity to deliver some of our covers in person, seeing a client light up saying they feel whole again after years of feeling ashamed of their prosthesis, is a very powerful experience and there have been a few happy tears and hugs along the way. It makes us proud to be able to use what we know and what we love to create something that our clients, in turn, feel proud wearing. It’s those moments, more than anything, that make all the hard work, late nights and weekends we put in to the studio, worth it. If I got your correctly, customers can choose between semi-custom and fully customised covers. What exactly does this mean? Yes, so in our current portfolio those are the two different design categories we offer at the moment. For both categories the covers are made to order and the shape and fit of the cover is completely customized to the client’s individual anatomy and existing prosthesis. What sets them apart is that for semi-custom designs, the client can choose from a collection of existing patterns, one pattern for the whole cover or combine two different ones for the front and back part of the cover. Colour-wise you can get practically anything, and just like with the patterns, either choose one colour for the entire cover or two different for a contrasting front and back side. For fully custom, we create a completely new design, exclusive to the client based on his/her own ideas and inspiration. Can you tell is a bit more about the actual product; the covers? Why are they special? What sets them apart from other covers like the ones from IDEthnos, ALLELES etc.? Currently, our main method of making the covers is through 3D-printing. It’s a technology that offers possibilities in creating complex shapes that no other production method can to the same extent. We work with a high level of customisation where every cover we make has a completely tailored silhouette to harmonize with the shape of the clients corresponding leg and the specific prosthetic components the client has, this means for example that we make sure that for above knee prostheses, the cover curves around the top of the prosthetic knee, for below knee prostheses that there’s a snug fit around the socket and that the bottom of the cover transitions well with the foot and the foot shell. We look at each individual client case and create the cover based on that. 3D-printing also gives us a design freedom, which as a design studio, is very appreciated and we can go all in when it comes to experimenting with 3D-effects in the designs, which we’ve done especially with many of the fully custom pieces we’ve created. Like doing for example mountain tops, skulls, flowers and butterflies, ‘coming out’ from the cover surface as a 3D-effect. We are also currently working on incorporating those types of effects and textures in our semi-custom collection as well. As a part of the design, we’ve also added small functionalities to some covers depending on the client’s needs or interests, for example a small compartment to store a pair of earphones for a client who loves to listen to music or a holder for a hex key for a client who’s always working on his motorcycle. We’ve also put a lot of effort in designing a mounting solution that makes it easy to take the covers on and off and to change between different covers to give the prosthesis a new style. It’s a type of snap-on solution where you only need one hand to change covers in seconds. But also from a functional perspective, to make it quick and easy to access for example socket valves, pin locks or to charge a microprocessor knee. On your website you stress the issue of individuality. What does it mean in the context of producing prosthetic covers? Why is that so important to your business concept and to the way you market the covers? Individuality is key to us. It’s what we want to encourage and help our clients to express through their cover. We believe there’s no “one size fits all” when it comes to expressing style and who we are, nor is one human body like the other, and it’s important to us to reflect that in the work that we do. The way it manifests itself is that every single cover we create in our studio is a one-of-a-kind piece that is tailored to the person who will wear it. A big part of that is inviting our clients to be a part of the creative process with us, to be the co-creator of their own cover. How many different designs do you currently produce? And which one is your personal favourite? What are the customer favourites? What is the best feedback from a customer you got so far? In the current semi-custom collection there are six different pattern designs to start from, but since you can combine the different patterns for the front and back part of the cover and also choose practically any colour or combinations of colours, the options are many. One of the client favourites from the semi-custom collection I’d say is one of the more detailed lace-like patterns. Many clients have also chosen to combine a very detailed lace pattern with a solid, smoother design. The best feedback really is all feedback that shows that our product and our work in any way have had a positive impact and created important value to the client. A cover can mean so many things on many different levels for our clients - for some who already felt comfortable showing off their prosthesis before, the cover has been more of a cool complement to their wardrobe, while for others, having the possibility to choose the look of their prosthesis through the cover, has been a determining factor for accepting or wanting to use the prosthesis at all, going from years of hiding the prosthesis to now wearing dresses and shorts, even in the winter (and the Scandinavian winters can get pretty cold you know). It’s amazing how personal design and fashion can really have that type of impact on so many levels. In terms of fully customised covers, are there any limitations to what you can do? Or is it basically: If the customer has a good idea, a special wish, a challenging need, you get it done! Honestly, most things are usually possible to do in one way or another. We always have a close dialogue with the client when making custom pieces and based on the ideas and wishes he or she has, we can give our suggestions on how we could bring that to life. The tools we normally use give us a lot of design freedom and so far there hasn’t been any custom request we haven’t been able to create. Some wishes and ideas are of course more challenging than others, either in terms of design complexity or that alternative tools or methods are required to get the best result, like for example other types of surface treatments, materials or painting techniques. In those cases, we usually need more time to explore what possible options could be and if we need to change the product completely. Part of our philosophy as a design studio, though, is to stay flexible and not limit ourselves to one production method or one single way of working, but rather pick the most suitable one based on what the client is asking for. The primary 3D-printing technique and material we’ve chosen for the covers are high-end options to get the best possible quality both when it comes to durability and design finish. Durability also depends a lot on the choice of design – a finer lace-like pattern can of course be more delicate and sensitive to shocks, whereas a more solid design can handle more. The covers overall, are created to handle the bumps of everyday life. For more high impact activities or extreme sports, we usually recommend taking off the cover during the activity. The best thing to do, though, is to reach out to us for specific cases or if you know there are certain activities you want to be able to use the cover for, and we can recommend or look at a solution for the design that could meet those needs. 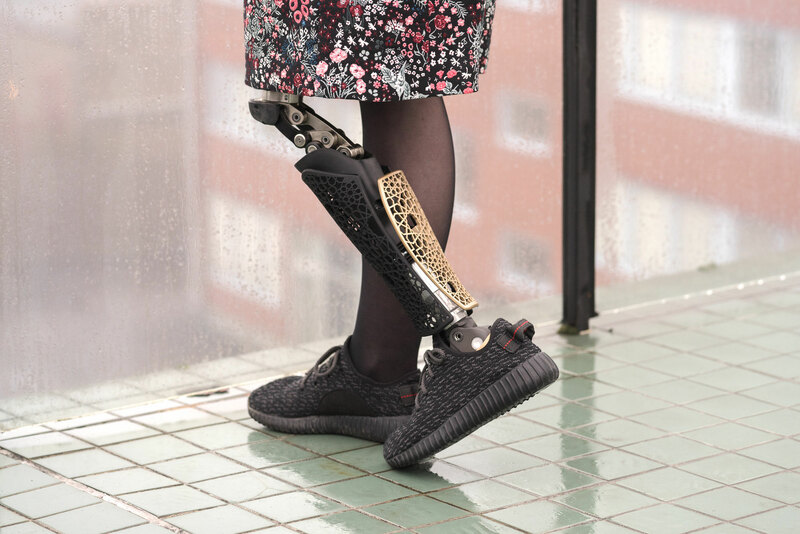 Absolutely – in the current process we start from a 3D-scan and a few photos and measurements of the prosthesis and corresponding leg (a few additional photos if there’s no 3D-scan available) – info that usually the client’s prosthetist sends us and that we use to create the best possible shape and fit of the cover. If the client is interested in a semi-custom design, they just let us know which patterns and colours they would like and then we’ll start creating the digital design based on all the input we’ve received. For a fully custom design, the creative process is much more extensive and a bit like getting a custom tattoo – the client can either give us complete design freedom or send us a mood board or a few pictures they find inspiring and a description that represents the idea they have in mind. If the client wants, we can do a Skype call or meet in person to discuss the ideas. We then start sketching on a design proposal and verify it with the client before we finalize the digital design that we in the next step can bring to life with 3D-printing, some finishing touches with post-processing/polishing and finally painting the cover. Trial and error phase – I’d say most of the stories so far are connected to the work designing a solution to attach the covers to the prosthesis. There was for example an early idea based on a magnetic solution that we tried together with Julia, our very first client, where the back part of the cover attached with magnets, but every time she slightly bumped the cover when stepping in or out of the car, it came off. So we ended up scrapping it and after a few more rounds of prototyping and testing we finally came up with the snap-on solution we have now, and we’re about to finish our 3.0-version of it in the coming weeks, where we’re adding a feature to make it easier to adjust the cover if the alignment on the prosthesis is changed. It’s a constant process, though. Trial and error will always be an essential part in both fine-tuning our current product and when developing new ones. Our studio is located in Sweden and in this first stage of our journey we’ve focused on Sweden and the Scandinavian countries, which is where we now have the great majority of our current users (we’ll keep sales numbers as a part of the business secrets though 😉). The covers we’ve delivered here in Scandinavia have all been reimbursed by the healthcare system and our clients’ prosthetic service providers are helping out in that process. However, we’re aware that this is not the case everywhere. We get a lot of requests from all around the world and we want our covers to be available no matter where you live or what the healthcare or insurance system in your country looks like. So we’re really working hard right now building a platform where we can offer our covers on a more global scale – to broaden the selection and types of covers, with a price range starting at 250/300 EUR and upwards depending on design complexity, materials and level of customization. Today, with our high-end 3D-printed covers, prices to end users start at just over the double. We’re also working on finetuning the ordering process itself to offer more ways that make it as easy and user-friendly as possible to order, no matter if it’s through your prosthetist or shopping online. We're so excited to get that in place, and we'll be announcing as soon as it goes live. What are Anatomic Studios’ plans for the future? Anything you are especially excited about? There are a lot of exciting stuff in the making right now – we’re working on a whole new collection of cover designs that we’re hoping to release later this year and we’re also preparing for a more global launch. Without revealing too much and spoiling upcoming surprises, I can say we’re also working on something that we hope can take the possibilities for our clients to be a part of creating their design, to a new level. We also have plans to expand our approach to other product categories as well, so I’d say our covers are actually just the beginning. We’re so excited to continue evolving as a design studio and more long term we hope we can contribute to pushing the prosthetics industry, and medical devices in general, towards a more conscious approach to design and attention to personal style and aesthetics. Emelie, thank you so much for your time. All the best for the future. And I make sure I pop by when I am in Malmö.